Poemata omnia (posthumously published poems of J. J. Scaliger), 1615, p. 35; (1864, Berolini: Bath edition, p. 38). Yale Vol. 18, pp. xxiv, 111, points out the citation of the "tears of the lexicographer" poem (epigram) in the Dict. "Preface," and, based on the title of the poem (provided by an editor in Poemata omnia) suggests this is based on an Arabic Lexicon by Scaliger. [BKG Note: Jan De Jonge, Henk, in Quaerendo, 1975, Issue 2, p. 147, states that Saliger completed a manuscript of Thesaurus linguae arabicae in 1597, which, in his 1607 Latin testament, he forbade to be published and which is now in the Leiden University Library (ms. Or. 212). 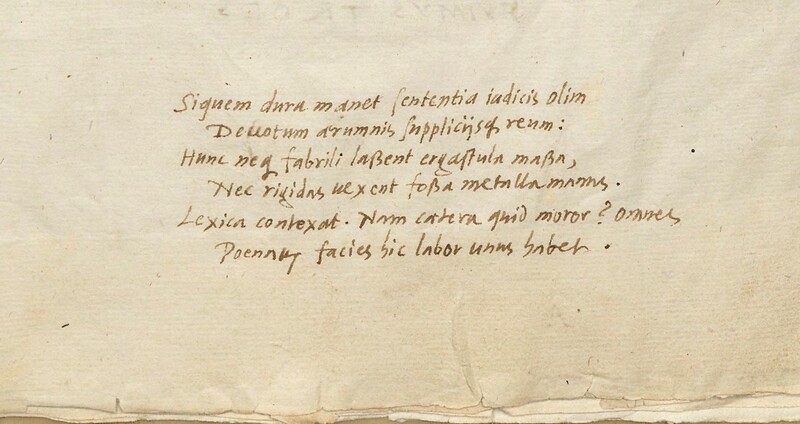 With the kind assistance of the Leiden University Library, I have determined that the Scaliger poem appears in the Preface of ms. Or. 212. There is a description of ms. Or. 212 at the private website of Professor Witkam: http://www.islamicmanuscripts.info/inventories/leiden/or01000.pdf with the text of the poem as it appears in the manuscript (which is slightly different than that published in Poemata Omnia). A full view of the manuscript is available on Brill: http://catalogue.leidenuniv.nl/UBL_V1:special:UBL_ALMA51278447730002711 ] The text of the published poem, from the 1864 publication, but the same in the 1615 publication which SJ would have read, is below. In the manuscript, also shown below, the second line reads "Devotum aerumnis suppliciisq. 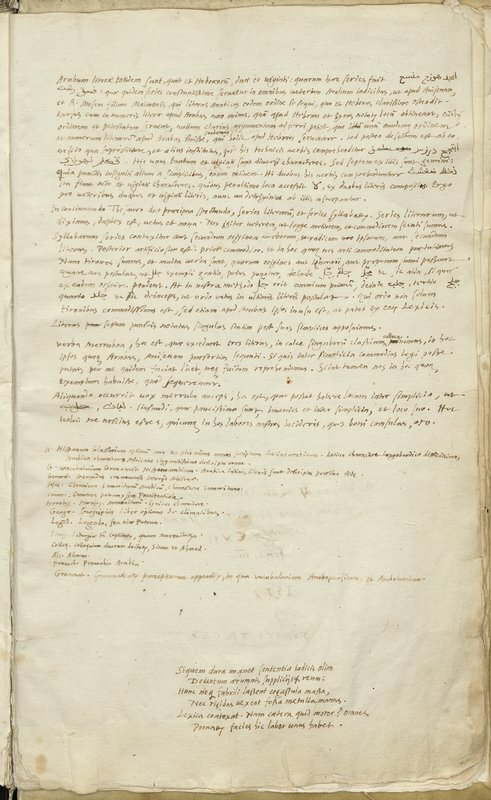 reum :" The full page of the manuscript is also shown at the bottom of this page, as provided by the University of Leiden Library. BKG Note: The second line of the manuscript poem, while worded differently, seems to have the same sense as the posthumously printed poem, perhaps with "The accused" rather than "His head." Let him start a Dictionary: why linger amongst the rest? Let not mining his work-stiffened hands besoil.